Scotland has some of the most progressive access laws in the world giving hill walkers and trekkers fantastic access to some of Britain’s wildest landscapes. However, Cairngorm Treks understands that with this degree of access comes responsibility. Accordingly we always work within the realms of the Land Reform Act  and take into account the rights and needs of private land owners, especially at specifically sensitive times of the year relating to game shooting. Cairngorm Treks also tailors its activities to ensure minimal impact on specific environments and their vulnerable species and ecosytems. Take responsibility for your own actions. Make sure you bring proper clothing and gear, be mindful of weather conditions and safety considerations. Respect people’s privacy and peace of mind. Keep a sensible distance from homes or gardens, use a path or a track if one is available and be careful not to startle people or animals at night. Help land managers and others to work safely and effectively. Do not hinder land management operations and follow advice from land managers. Respect requests for reasonable limitations on when and where you can go. Care for your environment. Don’t disturb plants and wildlife, take away your litter and keep to paths and tracks if they are available. Keep your dog under proper control. Don’t take your pet into fields with calves or lambs. And dispose of dog droppings. We strongly believe that our Mountain tTrekking experiences should have a minimal environmental impact. Accordingly, to reduce erosion and damage on footpaths and bivouac sites, we only work with small groups…generally no more than 6 people. Moreover, we look to vary wild camping sites and trails so they are not over used. We also work within the ethos of leaving nothing but our footprints. All rubbish is carried out and, where possible, reused or recycled back at base. 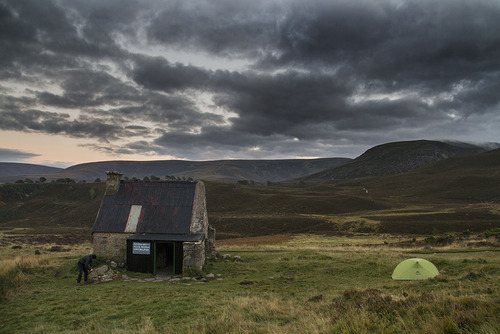 Cairngorms Treks does not use Mountain Bothies for overnight stays. This is in line with the Mountain Bothies Association’s policy that bothies should not be used by commercial groups and we fully support this. However, in the advent of an emergency we might use a bothy for your safety. We will also show you where bothies are in relation to your Mountain Trek, when and how they could be used and, for those who are interested, information on joining and supporting the Mountain Bothies Association.